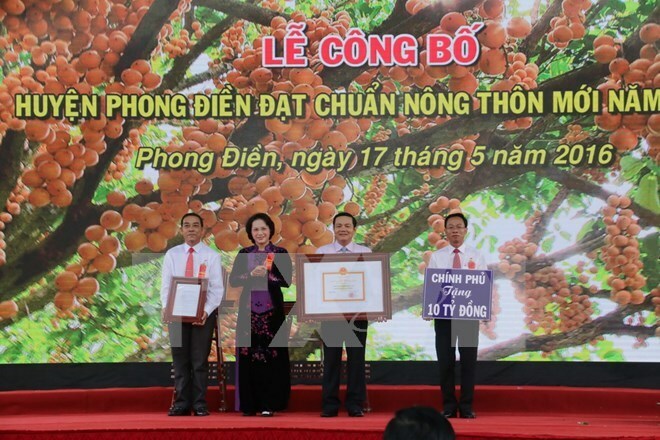 Can Tho (VNA) – National Assembly Chairwoman Nguyen Thi Kim Ngan congratulated Phong Dien on being the first new-style rural district in the Mekong Delta city of Can Tho at a ceremony held on May 17 to announce the status. She lauded local authorities’ effective initiatives for planning and infrastructure development. In addition to large-scale agricultural production, the city has organised farm trips for tourists, helping retain the beauty of local villages, she said, considering the model an example for other localities. Ngan noted that Phong Dien has utilised available financial sources to invest in rural infrastructure, adding that future action plans and programmes designed by local authorities ought to include particular tasks and standards to improve the quality of criteria for a new-style rural area rather than just fulfilling the criteria. In the last five years, Phong Dien has mobilised more than 1.8 trillion VND (81 million USD) for new-style rural development, of which over 25 percent came from residents and businesses – well above the national average. Currently, five out of six local communes have realised all the criteria, with Nhon Nghia commune fulfilling 17 out of the 19 national specifications. In 2016, all resources will be focused on helping Nhon Nghia complete its process. The National Target Programme on New Rural Development, launched in 2010, set out 19 criteria for new-style rural areas covering infrastructure, production, living standards, income, culture and others. A district must have at least 75 percent of its communes meeting all the 19 criteria in order to receive the title of new-style rural district. As of February, 1,761 communes across the nation had met the new-style rural area criteria, accounting for 19.7 percent. On average, each commune met 12.9 criteria, up 8.2 criteria from 2010, and 2.9 criteria from 2015.